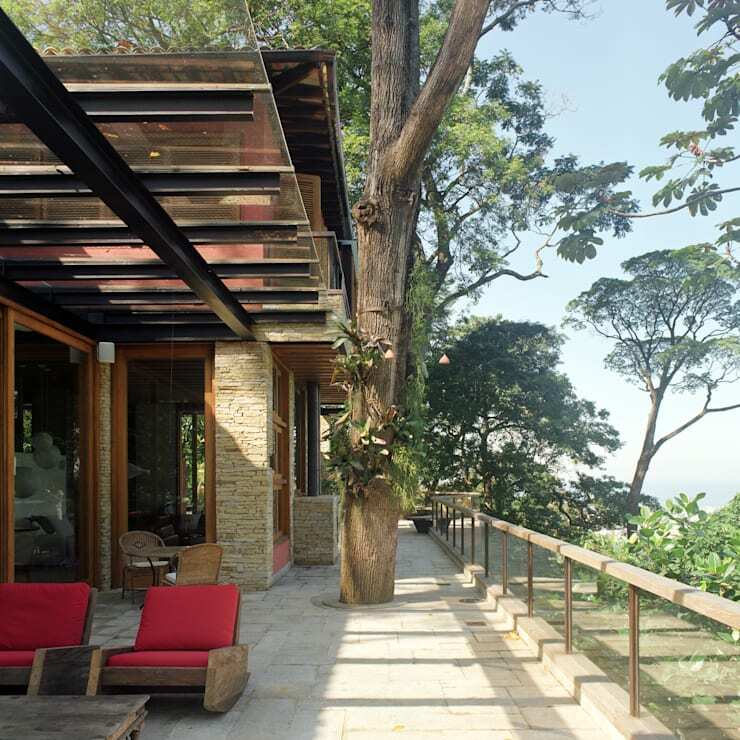 This enviable property, located and Brazil and designed by Rio de Janeiro's Maria Claudia Faro, showcases an engaging, modern home situated in an elevated, rural locale, which affords the owners the most spectacular of vistas. From the get-go the home intrigues, with its facade constructed of a series of red boxes interspersed with sections of pale, compacted stone. An expansive courtyard flow beyond the boxes, housing a pristine swimming pool from which the most magical of views can be admired. Ample space for outdoor living has been included, both in the courtyard, which also houses an external kitchen and dining setting, and around the side of the home, in which a stylish and serene outdoor setting lays in wait to accommodate more secluded relaxation. The home's interior is airy, light and furnished with an array of both modern and classic pieces. 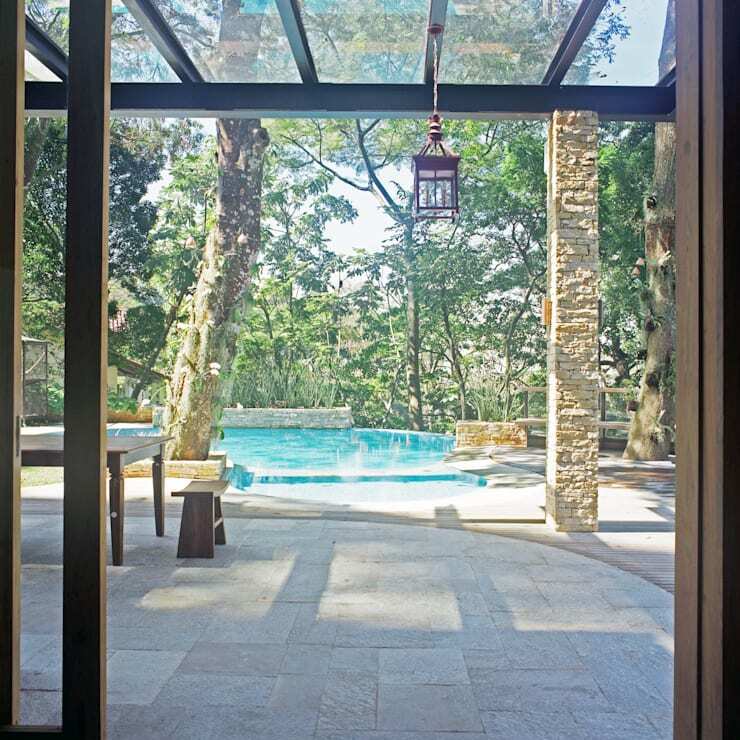 Best of all, the spaces for indoor and outdoor living amalgamate with ease, by virtue of a series of expansive windows and glass doors, ensuring that air and light can circulate inside whenever desired. The home's exterior displays a playful and engaging design, with its construction comprised of a series of red boxes, interspersed with sections of compacted stone. Couched in greenery, the home presents an idyllic locale in which to escape city life and relax, with fresh air, sunlight and the beauty of nature all around. Here we can see a generous space for outdoor living, with an external kitchen and dining setting resting in simple style by the home's swimming pool, laying in wait to accommodate the occupants and their guests for a casual get-together. Framing the home is a simple space for outdoor living, which peacefully overlooks this property's elevated locale, taking in a stunning view of the surrounding hills and mountains. A perspex shelter partially covers a stylish outdoor setting in timber and red, ensuring that this space can be utilised regardless of the weather. Here we can also see a range of expansive windows and glass doors enclosing the home, allowing light and air to flow inside with ease, and beautifully amalgamating indoor and outdoor living spaces. The home's interior truly seeks to blend with its open and inviting surrounds, with its lofty ceilings and huge windows allowing light and air to circulate with ease. 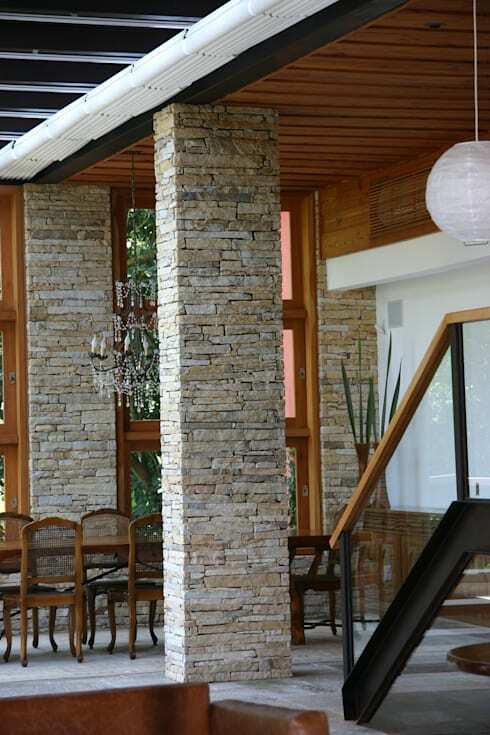 Compacted stone pillars, reams of timber and crystal clear glass characterise the decor, while the furnishings traverse modern and classic styles. The latter can be seen here in the indoor dining setting, which is comprised of a lengthy banquet table surrounded by understated, wooden chairs, with a delicate chandelier hanging overhead to provide ambient illumination. A change of perspective displays another stunning view of the home's outdoor area, with the cool blue of its pristine pool practically glowing in the distance. Curtains of leafy green frame the scene, while sunshine filters through from overhead. Ancient trees tower above, drawing the forest into the home's courtyard, and timber benches border the space, providing multiple vantages from which the occupants can sit and enjoy this home's extraordinary view. And the view is truly spectacular! 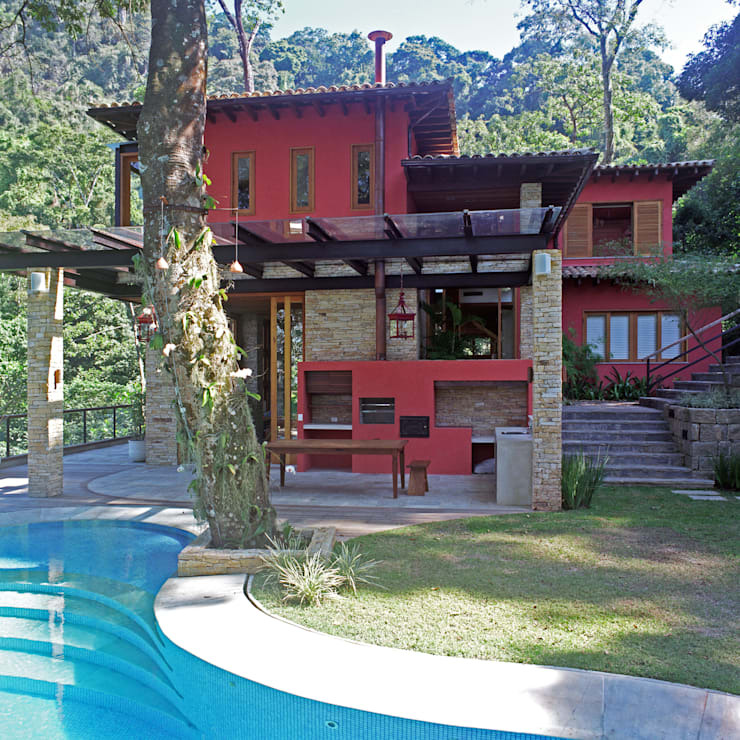 Over the pool's waterfall edge, and through a gap in the towering trees of the surrounding forest, a stunning mountain vista lays in wait to awe and inspire. A lush forest climbs its way up the rocky slopes, which can be seen with crystal clarity before a clear, blue sky. This vantage lends a magical sense of charm to this lovely abode, with the view able to be admired whenever the occupants are in the mood for a refreshing dip. Want to tour another home with a great design and gorgeous view? 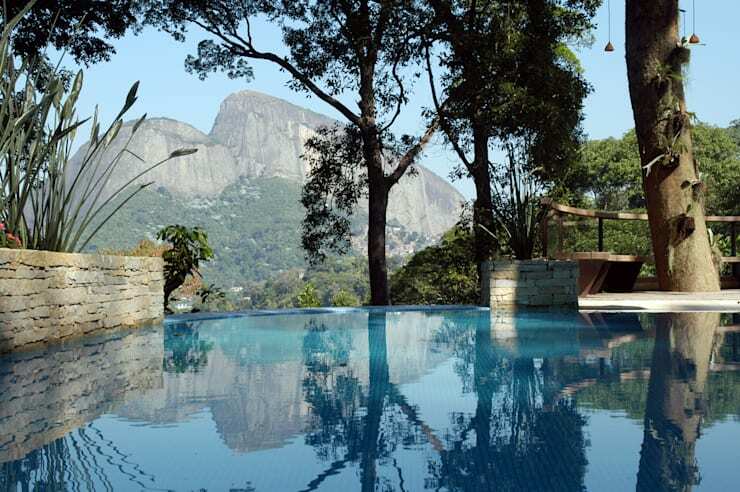 Then This Magnificent Brazilian Mansion is definitely for you! What's your favourite design element within this lovely home? Tell us below!